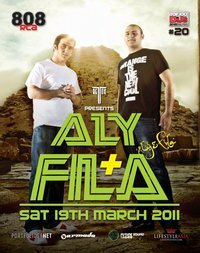 DJ MAG top 20 & highly respected Trance producers / DJ’s – ALY & FILA will be making their sensational debut @ 808 this month. This is a ‘must go’ event for all you electronic music lovers out there and it’s been a long time since Bangkok has had something of this caliber to offer you. 2011 sees the Egyptian duo at the forefront of the next generation of dance music super stars; they’ve already broken through the worldwide clubbing spectrum. On the Dj front, the duo is set to tour with Armin Van Buuren next month in Australia. Tracks released such as “Eye of Horus”, “Spirit of Ka”, “A Dream of Peace”, “Ankh – Breath of Life” and “Thebes” have earned them worldwide critical acclaim from the press and fellow artists. They have also become widely renowned for their energetic, live performances, which has enhanced their all round appeal to audiences around the globe. Having played at most major festivals, nightclubs and events the electronic music scene has to offer, Aly & Fila continue to take on the world, one party at a time. Retox has always been at the forefront of hosting world renown artists, so make sure you Join us this month as 808 enters the Trance-Zone once again – with ALY & FILA!! Since their burst onto the international clubbing consciousness with their massive hit “Eye of Horus” back in 2003, they have been a full-on inspiration to clubbers and DJs alike. Their euphoric, uplifting blend of sweeping trance has seen them rise to an A-list status alongside the likes of Armin Van Buuren, Paul Van Dyk, Ferry Corsten and many more. At the forefront of the next generation of dance music superstars, they’ve already broken through the worldwide clubbing spectrum. Tracks released on such as “Eye of Horus”, “Spirit of Ka”, “A Dream Of Peace”, “Ankh – Breath of Life” and “Thebes” have earned them worldwide critical acclaim from the press and fellow artists. Their remix work in 2007 alone was staggering, putting their touch to tracks like “Whatever – Lost Witness vs Sassot”, “Why – FKN* ft Jahala”, “Tears of Hope – Deems” and many more. 2008 also saw a huge surge on the production side, which started early in the year when Aly & Fila mixed the massive “Trance World 2 Compilation” on heavyweight record label Armada. Their production and remix schedule showed no signs of letting up, as they not only released an impressive array of huge tunes on “Offshore Music”, but also applied their masterful remix skills to a number of high profile hits and artists. As 2008 headed to a close, Aly & Fila continued their assault on the dance music scene, sweeping nominations and highly respectable positions in the biggest dance music polls worldwide. 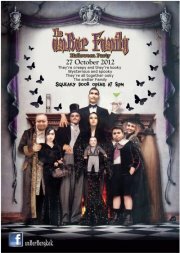 They were the 3rd highest new entry in the 2008 DJ Mag Awards as they reached the #31 position, up 80 places from 2007. Ranking #12 in Trance Addicts top 250 Poll. Voted one of the top remixers of the year at the 2008 Trance awards, and currently sit in the top 40 position at the world’s largest DJ Poll, DJList.com. 2009 also started at a rapid pace on the awards side, with Aly & Fila being nominated for Best Break Through DJ at the 2009 International Music Awards at the Winter Conference in Miami, alongside Deadmau5 and Laidback Luke. As we entered 2009, the productions came at us thick and fast, with remixes and originals released on their own record label Future Sound of Egypt Recordings. With touring every week to the biggest events worldwide such as Trance Energy, Trance Energy tour of Australia, A State of Trance 400 with Armin Van Buuren for 3rd year in row, A State of Trance @ Amnesia, Ibiza, tours of America, South America, Europe all in 2009 saw their following and profile raise again. 2009 has come to a close with again amazing success in the DJ Polls. In DJ Mag Top 100 2009 Aly & Fila climbed 9 places to #22, and are also #12 in the Trance Addict Top 250 DJ Poll. 2009 year has also seen the launch of their own label “The Future Sounds of Egypt”, (a sub label of “Offshore Music”) and will not only feature their own productions, but will also make way for some up and coming new talent, that the duo will introduce to the world. When you consider all they’ve accomplished in such a short amount of time, and have rallied the support of some of the biggest names in dance music such as Armin Van Buuren, have played at some of the most prestigious events and venues across the world, and continue to release, track after track, remix after remix, there’s no telling where this duo will end up.